Lettuce is most rewarding. It can be grown quickly and enjoyed daily. Growing lettuce used to be possible only in a temperate climate but new varieties mean even the tropics can produce this vegetable all year round without bolting to seed. Looking at traditional conditions, lettuce needs cool weather with decent sun to do well. It will grow in a garden bed or containers as long as it has enough room. Most varieties need 15-20cm (6-8") between plants and if in a container, one that is 20-25cm (8-10") deep. Lettuce must be kept moist and will respond well to compost and fertilising every 2-3 weeks. Going back to the tropics, successful lettuce growing incorporates drip irrigation for the dry spells, constant feeding due to the extra rapid growth, and raised beds or trenches and mounds to stop erosion due to tropical storms. Growing lettuce from seed requires care as the seeds are small and you might find it easier to start in seed beds first. Once they germinate they grow before your eyes! Thin dramatically if needs be and stagger their starts by a week or two to ensure a continuous supply. Plant them in a sunny spot, close to the house if possible, so you can nab a leaf or two for your salad. They need lots of watering and fertilising. If you are in a really cold area, apart from planting varieties that suit your conditions, you can plan to have a garden cloche on hand to protect them overnight. For the sweetest leaves with no bitterness, don't let the plants overmature in the garden. For Leaf lettuce, start cutting leaves as soon as they are large enough to eat. Cut about 2cm (1") above the soil line preferably with scissors. "Beaut," the plant will say, and set about sending up new leaves quickly. Watering in the early morning gives best results. If plants are damp overnight, this will invite disease. Don't water in the middle of the day onto the leaves as it can cause them to burn and go brown or mushy. First, there are four main types of lettuce. Head lettuce: This is the most common type found in the supermarket. It's a family sized dude. However, it's also the most temperamental when grown in the home garden. It takes the longest to grow and in hot weather will bolt to seed very quickly. Butterhead lettuce: Similar to head lettuce but with smaller, softer and more loosely packed leaves. 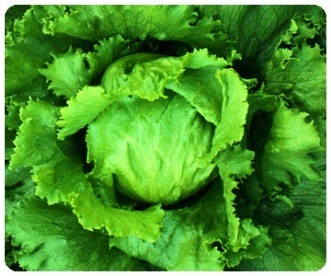 Leaf Lettuce: These types have open growth leaves. There is a wide variety of type, shape, taste and colour available in leaf lettuce varieties, such as the red/purple, curly and sword leaved varieties. They mature quickly and are easy to grow. These are often referred to as 'cut and come again' varieties. Romaine or Cos Lettuce: These plants are sweet with big, crunchy leaves. They grow upright with tubular heads of leaves and can get up to 10" tall. As for varieties, there are both cold resistant and heat resistant lettuce varieties available. The best tropical variety was called Minetto, but new breeds are always being developed. Speak to your local nursery about what is best for growing lettuce in your area. Pretty much disease resistant (keep an eye out for snails), you still always have to make sure you keep growing lettuces fast, otherwise you get bitter leaves and bolting failures. Many gardeners get more than half a dozen lettuce crops a year. Happy crunching.